The release of long snapper Danny Aiken was one of the day’s big surprises. 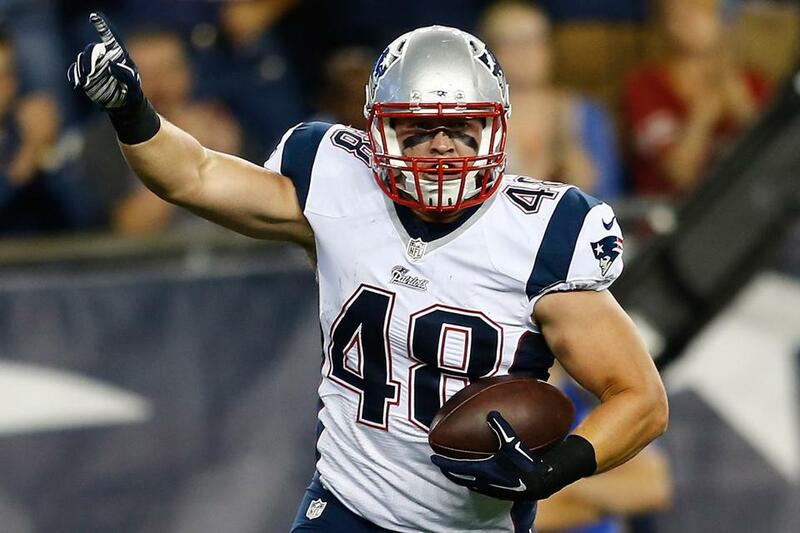 The Patriots released long snapper Danny Aiken and receiver Josh Boyce among 19 players on Saturday to get down to the NFL-mandated regular-season roster limit of 53. The team also placed rookie linebacker James Morris on injured reserve. The former Iowa Hawkeye was injured in the preseason finale on Thursday night. The 20 moves technically leave the Patriots with 55 players, but cornerback Brandon Browner and receiver Brian Tyms both must sit out the first four games of the season because of NFL suspensions. Neither counts against the 53-man roster during that time. The release of Aiken was one of the day’s big surprises. New England could always replace the fourth-year player with another specialist at the position, but for the moment Rob Ninkovich is the team’s snapper. Ninkovich, who was trying to make the Saints’ roster as their long snapper in 2009 when he was released and signed by New England, takes reps in practice and also snapped for Stephen Gostkowski’s first field goal attempt against Carolina two weeks ago. If the Patriots do not claim or sign another snapping specialist, it would mark the first time in the Bill Belichick era that the team began the season without a true long snapper. Boyce, a fourth-round pick out of Texas Christian last year, had a rookie season that was limited by injury. This summer, he failed to distinguish himself and likely sealed his fate with his poor showing against the Giants Thursday night: targeted nine times by quarterback Jimmy Garoppolo, Boyce had just two receptions. Two of those pass attempts ended up as interceptions, though one was negated by a defensive penalty. Under the new practice-squad rules, Boyce does have eligibility if the Patriots wanted to bring him back in that capacity. Another player released Saturday who saw action last season but also could be a practice squad candidate is linebacker Steve Beauharnais. Beauharnais had one of the best plays of the preseason for New England, intercepting Panthers backup quarterback Derek Anderson and returning it 61 yards. New England also released defensive tackle Jerel Worthy, acquired from Green Bay Aug. 13. A former second-round pick, Worthy underwent back surgery earlier this year and had a limited window to prove himself to the Patriots’ coaching staff, but apparently didn’t show enough, certainly not enough to beat out Joe Vellano, Sealver Siliga, or Chris Jones, the young tackles who all played significant snaps last year. The team also cut ties with 2012 third-round pick Jake Bequette. Despite totaling 23½ sacks in his career at Arkansas, in the strong Southeastern Conference, Bequette never made the jump he needed at this level, and was only active for eight games over his two seasons. Also released were veteran TE Steve Maneri, first-year players OL Braxston Cave, LB Ja’Gared Davis, S Kanorris Davis, RB Jonas Gray, and DB Daxton Swanson, and rookies OL Jon Halapio and WR Jeremy Gallon. Rookie free agents RB Roy Finch, DB Shamiel Gary, DL Eathyn Manumaleuna, OL Chris Martin, LB/FB Taylor McCuller, and DL L.T. Tuipulotu also were cut. With Halapio, Gallon, and Jamea Thomas, who was waived Tuesday, gone, three members of this year’s draft class already have been released. Players who appeared to be on the roster bubble who survived include RB Brandon Bolden, who saw very few snaps in camp or during exhibition games, rookie DL Zach Moore, who is trying to make the leap from Division 2 to the NFL, and OL Chris Barker, who was a healthy scratch in 10 games last year. Safe also is QB Ryan Mallett; it was speculated that the growth of Garoppolo in recent weeks might lead to Mallett being let go. But it’s almost guaranteed that Saturday night’s 53 will change — 700 players were released league-wide, and once Belichick and Nick Caserio get the chance to study the waiver wire, they may claim players, which would force corresponding moves. Last year, the Patriots were awarded four players, three of whom stayed with the team all season, whether on the 53-man roster or practice squad. In all, New England made 16 moves between final cuts and the first regular-season game last year, not including practice squad transactions.